Troma Entertainment is pleased to announce that Scarecrow Video at 5030 Roosevelt Way in Seattle, Washington will be hosting Lloyd Kaufman, President of Troma Entertainment and Creator of The Toxic Avenger for a signing on February 27, 2013 at 4:30 PM. 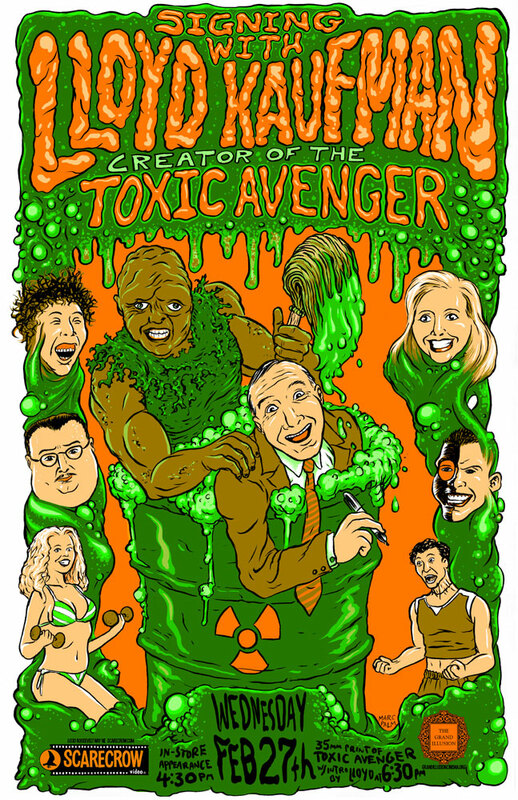 The signing will be followed by a screening of the Troma classic The Toxic Avenger at the Grand Illusion Cinema at 1403 NE 50th Street, located conveniently right down the street from Scarecrow Video, starting at 6:30 PM. Troma DVDs, t-shirts, posters, and additional Tromabilia will also be available for purchase. Unlike other celebrities, Kaufman does not charge for his autograph, and will sign any piece of Troma merchandise for free! For additional information on Scarecrow Video, please visit the event page HERE! To purchase tickets for The Toxic Avenger at the Grand Illusion Cinema, visit their homepage HERE! Established in 1974 by Yale friends Lloyd Kaufman and Michael Herz, Troma Entertainment is one of the longest-running independent movie studios in United States history, and one of the best-known names in the industry. World famous for movie classics like Kaufman's The Toxic Avenger, Poultrygeist: Night of the Chicken Dead, Class of Nuke'em High, Mother's Day and Tromeo and Juliet, Troma's seminal films are now being remade as big budget mainstream productions by the likes of Brett Ratner, Richard Saperstein, Akiva Goldsman, and Steven Pink. Among today's luminaries whose early work can be found in Troma's 800+ film library are Trey Parker, Matt Stone, Jenna Fischer, Robert De Niro, Dustin Hoffman, Kevin Costner, Fergie, Vincent D'Onofrio, Samuel L. Jackson, James Gunn and Eli Roth. Visit Troma at www.troma.com, www.lloydkaufman.com, www.twitter.com/lloydkaufman, and www.tromapast.tumblr.com.